Did you ever wonder what makes a great man or woman great? Was he just born that way or is there an external force determining his greatness? Certainly greatness stems from multiple factors coming together in just the right way, but here at Lily Direct we like to think that scent is definitely one small factor that makes up that elusive greatness mixture. And when one perfume house has perfumed an extensive collection of history’s greatest names, and continues to perfume contemporary greats alike, you have to stop and ask yourself, is it something in the spritz? The Creed perfume house has created a legacy of unrivaled scents, both commissioned and worn by a host of global royalty, politicians, movie stars and first ladies. It’s rumored that it all started with a bottle of ‘Royal English Leather,’ commissioned by King George III. Today, over 200 years later, First Lady Michelle Obama has said she is a devoted fan of Creed perfumes. Over the last two decades and beyond a wealth of famous names— Winston Churchill, JFK, Frank Sinatra, Jackie Kennedy, Audrey Hepburn, Madonna and Julia Roberts…just to name a few—have either commissioned or worn Creed scents. The list of famous Creed wearers is seemingly never ending: In 1920, at the request of Winston Churchill, ‘Tabarome Millesime’ was created; a take on the original ‘Tabarome’ fragrance, Churchill’s version contains notes of tobacco. ‘Spring Flower’ is said to have been commissioned for Hollywood starlet Audrey Hepburn in 1951. Since King George III there have been a plethora of European royals said to have commissioned scents from the Creed perfume house. Don’t worry too much if you are an ordinary person who cannot commission a personalized scent, Creed has plenty of exquisite scents on the market. Many of the scents that were originally commissioned are later available to the general public. You can find great deals on Creed scents such as ‘Original Vetiver’, ‘Love in White’ and many more right here on the Lily Direct website. With so many great names wearing Creed scents, isn’t it worth it to see if you can find success in a bottle? Most know the scent No.5. Everyone recognizes the name Chanel. Born in Saumur, France; Gabrielle “Coco” Chanel was born to an underprivileged family in the Loire Valley. Because of her humble beginnings, she was inspired to pursue a radically different lifestyle, first on the stage, where she acquired the nickname “Coco,” in later years she was a milliner. With the help of one of her male admirers, who provided financial assistance and social connections throughout her career, in 1913 Chanel was able to open her first shop in Paris. Soon after, Coco was able to open a second shop in the resort town of Deauville. With limited finances at her disposal, Chanel used jersey as her main fabric. Before Chanel, Jersey was used as the primary fabric for men’s undergarments. For the first few seasons, the Chanel line was limited to exquisite hats and a select line of garments, attracting dedicated patrons. Her style was simple, yet elegant. And jersey was the perfect fabric to compliment her bravura. Inspired by the the world around her, Chanel created uncluttered outfits, with boxy lines and shortened skirts. During the First World War, the Chanel line allowed women to leave their corsets behind and freed them for the hands-on activities necessary to support the war effort. Soon after, she repositioned her couture house in Paris to 31 Rue Cambon, still the center of operations for the House of Chanel today. Chanel continued to create tasteful looks for women throughout the 1920s and ’30s. Following the war, Chanel returned to fashion in 1953. Although not immediately popular, Chanel spent the subsequent years rebuilding her clientele and polishing her designs. The Chanel suit became a status symbol for a new generation, made of solid or tweed fabric, with its slim skirt and collarless jacket trimmed in braid, gold buttons, patch pockets, and—sewn into the hem—a gold-colored chain ensuring it hung properly from the shoulders. Following Chanel’s death in 1971, her assistants continued to design the couture and ready-to-wear lines until Karl Lagerfeld took over control of the haute couture design in 1983 and in 1984, he started to design the ready-to-wear line. Possibly Chanel’s greatest contribution to fashion is the iconic fragrance, Chanel No.5. In 1921, Chanel set out on a quest to revolutionize fragrances, and create a scent that embodied the modern woman. Her quest began after the summer of 1920. While on vacation with her then beau, the Grand Duke Dimtri Pavlovich, Chanel learned of an ornate, daring perfumer named Ernest Beaux. Beaux was a skilled craftsman, who was willing to tackle the challenge of creating Chanel’s signature fragrance. After months of toiling, Ernest returned to Paris to present Chanel 10 sample fragrances. Numbered 1-5 and 20-24, Chanel was given the easy task of picking her favorite. In honor of Memorial Day, let’s talk poppies. Remembrance poppies are used to commemorate soldiers who have died in war. You may see people wearing small artificial poppies on their clothing or you may notice poppy wreaths laid out on war memorials; so why not add wearing a poppy fragrance to the remembrance poppy tradition? Nothing can trigger one’s memory quite like scent can, so the idea of honoring a day of remembrance with the crisp, fresh scent of poppies is quite lovely. Here at Lily Direct we will certainly be wearing our favorite poppy scents to all of our Memorial Day BBQ s this weekend. Choose your favorite and start a new remembrance poppy tradition of your very own. We continue the bi-weekly presentations of the perfume houses from around the world. The first presentation was about Guerlain, this week we present Coty. Emeraude in 1921 and L’Aimant in 1927. 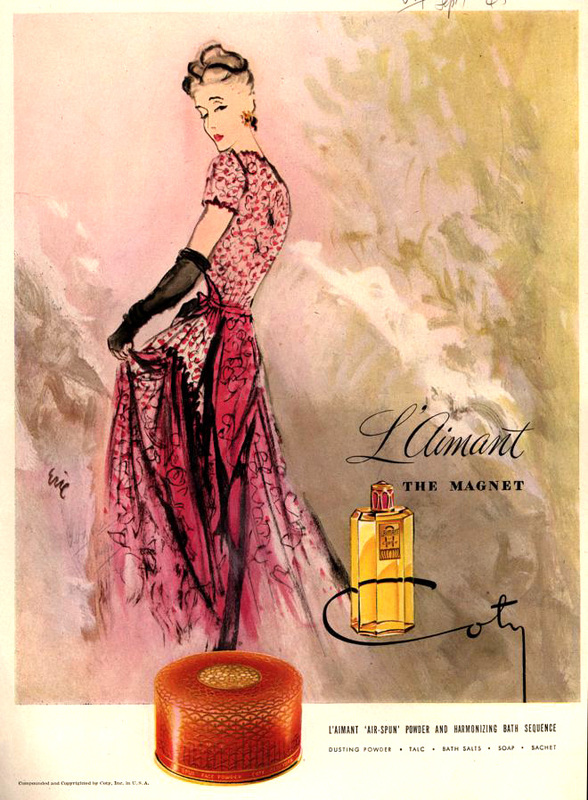 70 years later, L’Aimant was still one of the top selling perfumes in Britain. Lilydirect carries several of the Coty Brands at very reasonable prices, visit the site for many special offers! My two youngest children were ready. My husband would be ready in a few minutes, but I still had to straighten my hair and then get dressed. Normally I am the first one ready to go anywhere, marshaling the rest of my lagging troops. But today was different…my firstborn son Jim, was graduating from high school. Memories of his childhood flitted around my mind, slowing down my usually prompt ablutions. Pausing in my pursuit of sartorial grace, I sighed and thought about just how quickly 18 years had passed. I remember when Jim was just born- he was so small…so beautiful…so loud! We tried to have our children a few years apart, but nature does not always go along with your plans. Our second, Edward was born 7 years later and then our third child, Henry 2 years afterward. So Jim had a chance to experience many firsts. The first car, the first apartment, the first home and then the 2nd car. He was the first to ride the family bicycle with training wheels and the first to break a bone; and thankfully he only broke one. He was also the first to use his father’s cologne, Polo. In 8th grade for his graduation he asked his father if he could wear some of his Polo cologne. There was going to be a dance after the graduation ceremony and he wanted to smell good. My eyes teared because my boy was fast becoming a man, or maybe because Jim decided (like most boys) that if a little smelled good a lot would smell better! We managed to tamp the smell down a bit, but it really proved fortuitous that the lovely girl Jim was escorting had a rather bad case of hay fever…and couldn’t smell a thing! Polo became a mainstay in our household. Jim tried different scents but he always came back to Polo because it reminded him of an important father son bonding moment. Jimmy didn’t just borrow his father’s Polo in 8th grade; he also received his first shaving lesson. That moment always stuck with Jim, Polo was forever linked with his first steps on the road to adulthood. Back to the present day and we are all rushing out the door, but Jim is already at the ceremony with his friends. I wonder at the new friendships he will make as he continues on to the next phase of his life, College. Jim will be attending the Naval Academy, and what a fine Officer he will make; he will do a wonderful job of leading men. He has been leading his younger brothers for many years and they look up to him every day. Both his father and I could not be more proud and I know that when he leaves in the fall, his luggage will contain a bottle of Polo cologne. Lily Direct provides a wide variety of beauty products at wholesale prices and with Mother’s Day less than a week away, here are some of our last minute gift ideas. Order now to take advantage of our free shipping. Very Irresistible by Givenchy: Feminine fragrance created with five rose variances (Centifolia, Peony, Fantasia, Passion and Emotion), infused with star anise, and verbena leaf. We carry the 2.5 oz spray, 1.7 oz spray, 0.13 oz mini splash and 6.7 oz Body Cream. Daisy Eau So Fresh Sorbet by Marc Jacobs: A delectable spring treat. A reinterpretation of Daisy, fruitier and bubblier it transports you to a place that is exhilarating, happy and fun. It is a mixture of natural raspberry, grapefruit, pear, violet, wild rose, apple blossom, musks, cedarwood and plum. We carry both the 4.25 oz and the 2.5 oz spray. See by Chloe: An addictive floral fruity fragrance that captures the personality of a young woman fully embracing life. It is a mixture of bergamot, apple blossom, jasmine, ylang-ylang, vanilla, musk and sandalwood. We carry 3 piece gift set consisting of a 2.5 oz Eau De Parfum Spray, 2.5 oz body lotion and a 2.5 shower gel. Prada Candy Perfume by Prada: A myriad of floral notes coming together to create a scent fully of life, vitality and flirtatious. It is a mixture of sparkling cedrat, bouquet of cosmos, benzoin, caramel and white musk. We carry the 2.7 oz spray. Flower in the Air by Kenzo: A modern fresh, airy and ultra-feminine scent. The fragrance inspires a person to follow their dreams. It is a mixture of bergamot, pink pepper, rose, cedarwood and musk. We carry this scent in both the 3.4 oz and 1.7 oz spray. Beauty by Calvin Klein: Is a fragrance representing beauty, maturity and self-esteem. We carry a 2 piece gift set consisting of a 1.7 oz Eau de Parfum spray and a 3.4 oz Luminous Skin Lotion. Caesars by Caesars World: A warm fragrance combining orange flower, musk, sandalwood and rose. We carry a 3 piece gift set consisting of a 4.0 oz Eau de Parfum spray 3.4 oz body lotion and a 3.4 oz bath & shower gel. Live by Jennifer Lopez: A combination of fruity and floral scents designed to add a spring to your step. We carry a 2 piece gift set consisting of a 3.4 oz Eau de Parfum spray and a 6.7 oz body lotion. Relieve stress after a long day with a skin soothing bath. Juicy Couture caviar bath soak by Juicy Couture: A lush mish of watermelon, mandarin, passion fruit, apple, tuberose, caramel brulee with woods and patchouli. We carry a 7.5 oz bottle. Lily Direct carries an extensive inventory of scents, lotions and creams. Go to our site and see many more selections available for delivery just in time for Mother’s Day.